I've seen this in cichlid tanks for the purpose of reducing aggression. My question is why is this only successful with cichlids and not say betta fish or pea puffers? I just did an extensive overstocking experiment... for a while all I had was a 5 gallon nano tank with a betta, and I was tempted to add other things, for starters MTS (Malaysian Trumpet Snails), and then 5 amano shrimp, and finally 6 pygmy cories. I was faithful about weekly 33% water changes, but my nitrates and phosphates trended high all the time, so you're producing stress. Since then I've gone to three tanks a 5 gallon, which is a refugium to breed inverts, and a 10 gallon which has cherry shrimp, and the 29G which has 8 cories (7x Aeneus, and 1x Pygmy), 1 betta, 5 amano shrimp, and MTS. With ample plants, my nitrates and phosphates are down to 0 all the time and I am now interested in finding out, as I add more fish, when I start seeing nitrates run up. I think it's mainly duck weed and hornwort which take out massive amounts of nutrients, although all plants help of course. Aqueon CUE 5 gallon, Aqueon 10G, Aqueon 29G, all of them pimped out with new equipment. Improve the quality of your questions. 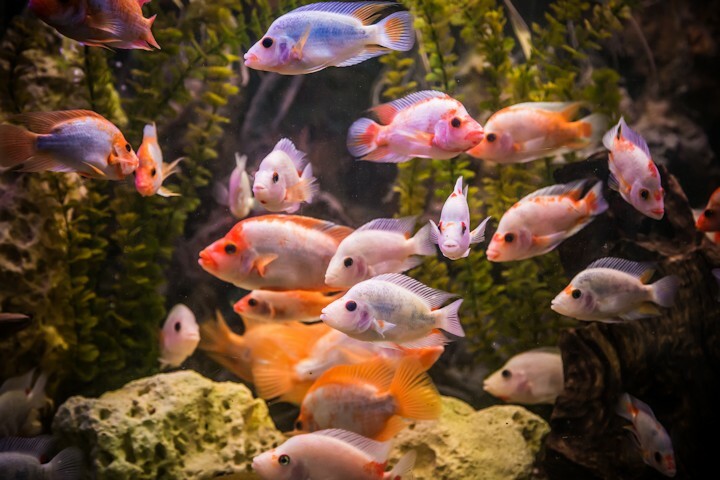 Should businesses sponsor high-level aquascaping competitions? If you were given $10,000US to build your dream aquarium, what would you spend your money on? Can you overstock a tank? I have a severe mental illness that makes me post weird things sometimes when I'm unwell. Please don't take offence. I'll be back to normal soon. Success rates vary and it depends on which fish and what type of environment. I've read a lot of good posts in here and agree with many of them. Personally I have one massively overstocked tank, my guppy tank. It's a 40 Breeder w/ cory cats (6 for sure, but there may be 12, I can never get an accurate count), 1 Blue Gourami, and about 70 or 80 guppies varying in size. I managed this tank w/ heavy planting and weekly 50% water changes. Nitrates rarely get over 20/30 prior to a water change and the fish are fed twice daily. But I wouldn't try this with all the fish out there nor would I try it without being heavily planted. We have a person locally who has a massively overstocked live bearer tank without live plants. He does 90% daily water changes on that tank to manage it. Also run an LFS so I deal w/ over 30 tanks daily. In terms of defining what "overstocked" means, what do people think of AqAdvisor? Is that the standard we're talking about? (D) increasing water surface turbulence, which results in a higher gas exchange between the water and air, meaning more oxygen is entering the water (benefiting fauna directly and increasing the potential activity of nitrifying bacteria), as well as more carbon dioxide leaving the water (which, adversely, reduces the benefits of using plants to handle bio-load), and also, to a lesser extent, the removal of Nitrogen from the system entirely. These aspects only address the biological, physical well-being of the inhabitants, and are generally the only considerations given to fish/fauna that are intended for production purposes, such as live-animal marketing or as food sources, and in such cases are often held in tight balance--for cost/benefit purposes--just enough to prevent stress-related casualties or stunting. BUT, our fish are supposed to be our "pets", so a much larger margin of comfort (and safety) is presumed to be desired. (E) simply enough cover (plants, rocks, caves, etc.) all around the aquarium so that shy, timid species feel comfortable enough to come out and show themselves (in good color) because they know there is always a hiding place nearby that they can dart into if the urge arises..
Often, especially in commercial enterprises, just the bare minimum is provided to cover the specific needs of a fish at specific times, such as bare-bottom tanks to make it easier to provide better water quality for discus, since their need for high water quality is stronger than their need for visual or structural "niceties", or for breeding tanks being bare, save for the bottoms covered with marbles for breeding egg-scattering species, or simply suspended "mops" for koi to lay their eggs in, or floating plants for live-bearer fry to hide in. Most quarantine or "hospital" tanks are relatively bare for sanitation's sake, with possibly just a few objects or hiding spots to reduce the fish's stress level. Such plain, basic setups are specific to their purpose and serve the faunas' over-riding needs at the time and are, in most hobbyists' eyes, only temporary and unsuitable for the long-term housing of animals which we portend to care about as pets. (3) NUTRITIONAL NEEDS, the third main aspect of all pet-care, is only applicable to the concept of "overstocking" in the sense that in large groups of mixed species (or sometimes with just a few individuals of the same aggressive species), some animals may be "bullied" or just out-competed for available food when the "feeding frenzy" occurs, so in such a case, the aquarium could be said to be overstocked, even though this is more a case of "wrongly stocked", or mismatched tank mates, or it could even be as simple as not providing the proper variety of foods, such as both floating and sinking, to match each species' needs.. Overall, almost any perception of a tank being regarded as "overstocked" can be argued against with regard to its purpose, and most situations where some would consider a tank to be "overstocked" are mitigated by the effort put forth to maintain a margin of environmental safety within the system and the mechanical methods employed to ensure that margin, how large of a safety margin the aquarist desires and thinks is appropriate, the inclinations and behaviors of the species within that system, and the personal opinion of what the aquarium owner thinks is visually appealing. From an ethical point of view, a tank is not "overstocked" unless the inhabitants of the tank are under stress of some type, be it environmental (water quality), behavioral (poorly chosen tank furnishings, ill-advised tank mates, not enough territory, a bad male/female ratio, etc. ), or nutritional (not enough food provided to each occupant). Anything beyond those criteria is purely an opinion, and opinions are like as--...er...um....belly-buttons...yeah, that's it, "Opinions are like bellybuttons: everybody's got one." That's mine. "May the Fish be with you." Last edited by Olskule; 08-24-2016 at 08:53 AM. Reason: grammer correction--shhhh, don't tell anybody! One thing I rarely see mentioned is just how bad all the estimates and calculators out there are for really deciding if you're understocked, overstocked, or perfectly stocked. I mean, I get it. It helps to have something to go on, but they are about as pertinent and useful as the old Wattage/Gallon calculators, in the age of LEDs. For instance, most of those calculators use an inches of fish per litre of water formula. But, is 1 inch of cardinal tetra really the same as 1 inch of pleco or cory or ram? No. Not even close. They eat a fraction of the amount, and clearly, poop a fraction of the amount. They also need less space to feel comfortable. Anyway, some people might say 100 cardinals in a 55G is way overstocked, and indeed, the first 3 calculators I googled said I was dangerously overstocked. But, 100 cardinals will do just fine in a 55G. Without any super difficult water change requirements. Anyway, in the end, if the fish are happy and healthy, you aren't overstocked. -- 2.5 Gallon mini bowfront with a field of crypt wendtii, some java fern, java moss, 8 RCS, and several species of snails. -- 55 Gallon long with Green Rotala, Crypt Wendtii, Red Ludwigia, Blyxa Japonica, Bacopa Carolinia, Banana Plant, Dwarf Sag, and an Amazon Sword. 2 Bolivian rams, 2 German Golden longfin rams, 2 German Blue Longfin Rams, 17 Rummies, 7 Neons, and a lonely Amano.